Dobble is a speedy observation game where players race to match the identical symbol between cards. 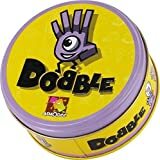 Reliant on a sharp eye and quick reflexes, Dobble creates excitement for children and adults alike while keeping every player involved in the action. This entry was posted in Aquatics and tagged Card, Dobble, Game by One Boutique. Bookmark the permalink.